3 large eggs whisked ( or 9 Tbs of aquafaben chickpea water). 2 large egg whites whisked ( or 3 Tbs of aquafaben chickpea water). In a large bowl, combine all dry ingredients, set aside. In a separate large bowl, whisk together the eggs and egg whites or aquafaben, almond milk, vinegar and coconut oil. 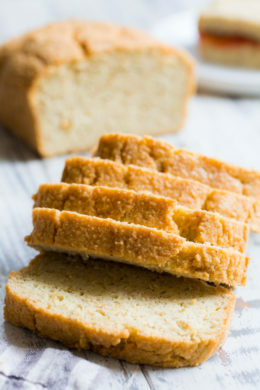 Slice as desired and store leftovers covered tightly in the refrigerator for up to 4 days – you can also freeze this bread to keep it longer. Enjoy!